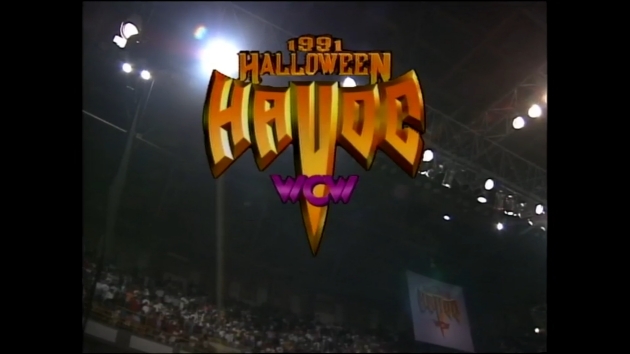 Once upon a time October was all about Halloween Havoc, one of WCW’s most beloved and anticipated events. 25 years ago today the controversial Halloween Havoc ’91 took place from Chattanooga, Tennessee. And to mark the occasion Throwback Thursday, with a little help from the WWE Network, journeys back to this vintage WCW PPV event to see just how well it holds up all these years later. By this time in 1991 World Championship Wrestling was struggling to re-establish itself after their biggest name, Ric Flair, defected to the World Wrestling Federation after a contract dispute with Executive Vice President Jim Herd. But Dusty Rhodes’ return earlier in the year had Jim Herd and others in TBS hopeful that the same Dusty magic that helped launch Jim Crockett Promotions to the moon in the early-1980’s could help turn WCW around in 1991. With the collapse of the wrestling boom of the 1980s, however, it was simply not meant to be as the entire industry experienced a contraction not seen since the ’50s. Lost in the fog of bad business and terrible booking, though, were some of the best workers in the industry and, as this event illustrates, some classic action, proving that the “Dark Ages” of WCW were alight with rays of hope. Context is a bit of an issue on the Network for this one. Though all previous PPVs and COTCs are available, the weekly TV from the era is currently missing. The show opens with a goofy haunted house graphic. Inside the arena Jim Ross and Tony Schiavone welcome us to the 3rd annual Halloween Havoc PPV. Jim Ross runs down the card before sending it to Eric Bischoff who is outside interviewing the wrestlers as they arrive. When Barry Windham and Dusty Rhodes arrive Arn Anderson and Larry Zbyszko, visible in the reflection of the car, pounce from “out of nowhere” and slam Windham’s right arm in the car door. Rhodes helps Windham to the passenger seat before taking off for the hospital. Back to the arena and the first match is about to kick off in the ring. This match starts out fine as an 8-man street fight, but it rapidly becomes a train wreck of biblical proportions. Masked guys in caskets, a “chair of torture” that fills three-quarters of the ring, ghouls, a power switch that won’t stay up, and the infamous “Refer-eye Camera” are only the tip of the iceberg for this disaster. Eventually Rick Steiner tosses Abdullah the Butcher into the chair while Cactus Jack, thinking Steiner is going in, tosses the switch. Fireworks go off, the lights dim, and the ring catches fire as the babyfaces take it at 12:36. Post match Abby goes nuts, beating up Cactus Jack and the ghouls. Backstage Eric Bischoff, dressed as a vampire, and Missy Hyatt, dressed as a showboat chorus girl, interview The Young Pistols about the United States Tag Team Championship held by Todd Champion and Firebreaker Chip, The Patriots. For those wondering, Creature #1 is the late Joey Maggs and Creature #2 is Johnny Rich. This a basic TV tag team match and nothing more. The Creatures get a bit of offense in before P.N. News ends it at 5:16 with a big splash off the top rope. This marked “The Creatures” one and only match in WCW. This is just a good ol’ fashioned rasslin’ match from two of the best wrestlers to ever grace a ring. The psychology, the wrestling, and the story are pitch perfect. At this time in 1991 Terry Taylor was finding success after joining the York Foundation in January at COTC XIV while Bobby Eaton was having his best solo year yet. In the end, Eaton blocks a superplex attempt, knocking Taylor to the mat, before connecting with the Alabama Jam for the pin at 16:40. Though this match helped establish Badd’s character, this one is not very good. Garvin ducks the big left hand and hits a devastating DDT on Badd but Teddy Long is distracting the referee as Hayes celebrates with the fans. Garvin goes to the ref, turns around, and is clobbered with Badd’s “Kiss That Don’t Miss” left hand for the pin at 8:26. Backstage Missy Hyatt is on the lookout for the WCW Halloween Havoc Phantom when Bobby Eaton walks by, towel around his neck and a large pumpkin in his arm. Hyatt pesters Eaton about the identity of the Phantom but Eaton doesn’t know anything. He just want to be left alone so he can celebrate with his pumpkin. This is a great match. Two of the company’s greatest wrestlers, both in their rookie years in WCW, tearing the house down for the TV title in a physical, psychological, bloody battle. After fifteen-minutes of nip-and-tuck action, with Dustin on the verge of winning, the bell rings at 15:03 and the match is declared a draw with Austin retaining the TV title. A Starrcade ’91: BattleBowl – The Lethal Lottery promo airs next. Oz had been going downhill since the Great American Bash ’91 PPV when he suffered his first loss to Ron Simmons. Gone is the goofy mask, over-produced entrance, and any shred of Oz’s credibility. This one was nothing more than a competitive squash with Kazmaier catching Oz in a Torture Rack for the submission at 3:58. Well, this match isn’t much of anything. Van Hammer hits a few big moves and then a very dangerous looking slingshot suplex for the win at 1:13. After the match we see a couple of pre-taped promos from Brian Pillman, then Alexandra York and Richard Morton regarding the following Light Heavyweight Championship finals. This is another classic WCW match. The timing and psychology are top notch, as is the wrestling. 25 years later this remains one of Brian Pillman’s greatest matches. 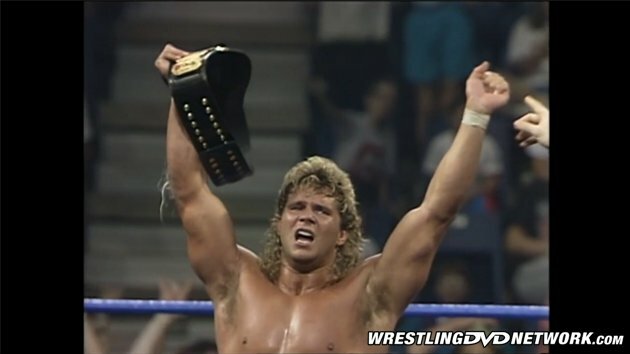 In the end, after a very close match, Pillman connects with a flying crossbody for the pin and the Light Heavyweight title at 12:44. The Phantom comes to the ring to Bach’s Toccata and Fugue in D minor, doing his best to hide his face. Zenk, who just had a TV title match at COTC XIV, is now the jobber for the masked Phantom. We’re supposed to wonder who’s under the mask, but when the Phantom hits the Rude Awakening for the pin at 1:27 all mystery is gone. Another Starrcade ’91: BattleBowl – The Lethal Lottery promo airs. The Enforcers had just won the World Tag Team titles at COTC XVI after defeating Rick Steiner and Bill Kazmaier in the finals of an 8 team tournament while The Patriots, WCW’s male strippers, were lucky to be in the same ring with Anderson and Zbyszko. After some average tag team action Firebreaker Chip and Zbyszko collide, allowing Anderson to connect with the spinebuster for the 1-2-3 at 9:51 to retain the titles. After the match JR throws it to Eric Bischoff on the ramp who is set to interview Paul E. Dangerously (w/Madusa). Dangerously rants about losing his commentary gig on WCW, saying he’ll get even by eliminating Sting. Paul E. then introduces the WCW Phantom, who comes out, takes off the mask, and is revealed to be “Ravishing” Rick Rude! There’s a minor pop from the Chattanooga crowd as Rude verbally derides Sting. Next up is a great training montage for Ron Simmons starring then-Florida State Seminoles head coach Bobby Bowden who gives Simmons some words of encouragement. The story of this match started out as a match-up of two of WCW’s greatest athletes but devolved into a petty, racial mess at the contract signing (1:37:28) at COTC XVI. The first fall starts with Luger in complete control until Simmons hits a few big moves. Simmons hits a beautiful powerslam and then a huge spinebuster to get the first fall at 4:55 to take a 1 – 0 advantage. The second fall is much more of a psychological wrestling match revolving around Luger overcoming an injured back. Luger takes the second fall by DQ at 16:26 after he falls over the top rope lunging at Simmons while Race hold Simmons down, evening the match at 1 – 1. Luger enters the final fall bleeding from the eye. It’s back and forth in the final fall with Simmons getting the best of Luger more often than not. The crowd is hot for this match, which turns on the outside when Luger ducks and Simmons hits the football tackle on the ring post. Luger takes advantage, hits a sloppy Attitude Adjustment piledriver, and gets the final fall at 22:00 to win the match 2 – 1 and retain the World title. As Simmons is being helped to the back, JR and Schiavone give their closing thoughts on the show and sign off as the credits roll. This card, like WCW at the time, is a mixed bag. In between the garbage there is some high quality wrestling to be found, but that does require sitting through the rough stuff. The highlights of the night are clearly the “Top 10” match, the TV title match, the Light Heavyweight finals, and the main event. Four out of eleven is not good. While the event may have been decent for the times, when the wrestling industry as a whole was collapsing, it’s aged terribly! Already subscribed to the WWE Network? Then go check out this spooky Halloween Havoc event (if you dare!) and let us know what you think in the comments section below. Looking for even more on the award-winning WWE Network? Drop by WWENetworkNews.com. Watch every WCW PPV in history, Hell in a Cell 2016 this Sunday, and 6,000 more hours of content only on WWE Network. Your first month is FREE! Click here to subscribe to WWE Network. Abdulah was subbing for the One Man Gang if your wondering. You are correct. Abby was announced as the replacement on the Oct. 5, 1991 edition of WCW. I left him off as a sub because Gang was effectively done with WCW by the time of the PPV. The others subbed were still working for the company. It was a judgement call, but you are right, Abby was put in the match to sub for Gang originally.